Recently I reviewed Frithjof Schuon’s “Understanding Islam“. Actually I find that title more fitting for Nasr’s book, but of course Schuon was 26 years ahead. While after reading Schuon’s book I had the idea that I perhaps learned something about Islam, I did not understand it better. With Nasr’s book this is much different. 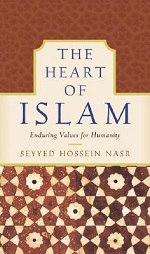 Seyyed Hossein Nasr (1933-) is a born Muslim (Persian) and raised in the Middle East. He studied in America where he now also teaches. He is a lifelong student of Schuon, well-respected in the scholarly West and in traditional Islamic circles and a Traditionalist (as was Schuon). Many leading Traditionalists were born as Muslims, or converted to Islam. This is not so strange, because Islam sees itself as a branch of the religio perennis. As the author writes: “Islam sees itself as at once the primordial religion, a return to the original religion of oneness, and the final religion”. “The Heart Of Islam” is divided in seven parts. The first explains the quote above. In the second you will learn that there is not something as the Islam. Like there are many forms of Christianity, there are many forms of Islam. Nasr describes the big division between Sunnism and Shi’ism and currents and schools within these two. These currents and schools are roughly to be divided in Traditional, modernistic and “so-called Fundamentalistic”. Nasr is glad to conclude that the first group is still by far the biggest, but unfortunately the second is growing and the latter gets most attention in Western media. The other parts speak about more specific subjects. Divine and human laws; peace, love, beauty and compassion; the community; justice and human rights and responsibilities. Nasr discusses at length and at various places what the Shari’ah really is, but also how often the term is misused for non-religious reasons. Very interesting discussions follow about environmental issues, the decline of the world caused by the West, religion, politics, society, etc. Now Nasr is, like I said, a Muslim by birth. He knows the ‘Islam from the desert’ and is well familiar with the Western world. When describing elements of Islam he often quickly passes over excesses of recent years. I am sure that these elements are much enlarged by our media and governments and it is not that the author is totally uncritical and tries to turn everything into something positive, but I would have liked to read a bit more about certain subjects and I totally miss the question of honour and the honour killings. It is probably true, but Nasr blames the West for all excesses as well. There were no problems before Napoleon went south and currents such as modernism and “fundamentalism” did not exist before the West came to impose the materialistic way of thinking and democracy. Basically Nasr’s book seems to be a plea to the West to leave the “abode of Islam” in peace to solve its own problems in its own way, together with, but not led by, the West and the East. I think this is a fair call. Read “The Heart Of Islam” to learn about Islam, understand it better, think about what happens in the world since the last centuries and get acquainted with an interesting religion that is much alive and has a big role to play in the world. When one thinks of Islam, one should go beyond the repetitive scenes on television of wars and battles, which unfortunately abound in today’s world, to behold the peace and harmony of Islamic art seen in the great mosques, traditional urban settings and gardens, and the rhythm and geometry of calligraphy and arabesque designs; read in the poems that sing of the love that permeates all of God’s creation and binds creatures to God; and heard in the strains of melodies that echo what we had experienced in that primordial morn preceding creation and our descent into this lowly world.